For gates up to 1,500 lbs. or 50 ft. in length. 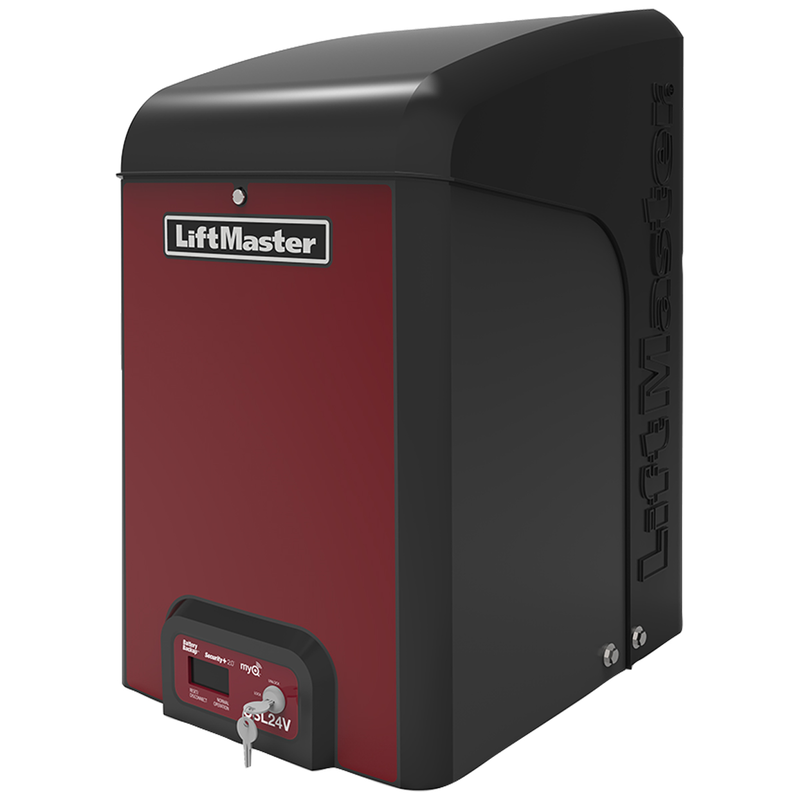 This is a LiftMaster CSL24VDC Commercial Slide Gate Operator. Engineered for more than a million cycles in high-traffic heavy-duty applications, the CSL24VDC is ideal for the most demanding slide gate environments. Industry-leading power management technology extends battery backup for up to 24 days without recharging, providing greater security and reliability. No one else can offer you that peace of mind. Access your property like never before. With MyQ® Technology you can monitor and control your gate from anywhere and get in quickly and securely with the built-in interference eliminating Security+ 2.0™ radio. • MyQ Technology enables you to securely monitor and control your gate operator and houselights with your smartphone for greater peace of mind. • Alerts can be received as email or pop-up (push) notifications on your mobile device so that you always know the status of your gate operator. • Wireless Dual-Gate Communication saves unsightly driveway scars by eliminating expensive conduit for dual-gate communication. • Million-Cycle DC Motor is engineered for more than a million cycles and is designed to perform in the most demanding applications. Soft start/ stop operation extends operator and hardware life for heavy-duty gate use. • Battery Backup safeguards your property by providing up to 208 cycles or up to 24 days of standby power when the power is down. • Solar-Ready Ultra-Reliable System delivers power when you need it most to operate the gate and is extremely power efficient at all other times to maximize solar performance. Home owners may qualify for 30% solar tax credit. • Gate Size rated for gates up to 50 ft. in length or weighing up to 1500 lbs. • Security+ 2.0™ Patented Multi-Frequency Secure Radio Technology virtually eliminates interference and offers 2X the range of standard remotes so you can access your home quickly and safely. • Quick Close/Anti Tailgate Selectable Feature quickly secures gate and prevents unauthorized access. • Plug-in Loop Detector Inputs Innovative Design ensures vehicles are easily identified to exit property or interrupt gate travel if a vehicle is in its path. • Safety Inputs are provided for the addition of safety reversing devices. Each entrapment point should be protected with its own device. • UL/cUL Listed tested to the most stringent industry guidelines.